As you are undoubtedly aware, there are 12 signs of the Zodiac (Aries, Taurus, Gemini, Cancer, Leo, Virgo, Libra, Scorpio, Sagittarius, Capricorn, Aquarius and Pisces) and, depending on what you believe or read, wherever your birthday lands in terms of these signs will heavily dictate your own particular characteristics and talents. Of course, IMHO this is all hogwash (although just quietly I have to admit to reading my horoscope when I stumble upon it). Anyway, new-age mumbo jumbo aside, when I first heard about Skoda’s brand new seven-seater SUV, the Kodiaq, I misheard Zodiac and the birth signs meaning came to mind. Uncannily enough, at the recent New Zealand launch, I found 12 major aspects that really grabbed my attention. First of all was its design. Make no mistake, at almost 4.7 metres long, and a fraction over two metres mirror to mirror, it’s every bit the seven-seater SUV; but it carries its size really well. It has a broad look to the front, in part because of the wide grille, high-seated fog lamps and inset crystalline headlights with bohemian glass work. But the low, wing-to-wing air scoop really reinforces the image. Its tapering and sloping roofline gives a more compact profile (without compromising the interior head room) and around the back, the C-shaped LED tail lights add a touch of class as they extend into the rear wings. For launch there are three editions available (Ambition, Ambition+ and Style) taking the Kodiaq from well-spec’d to almost the ridiculous. The Ambition comes loaded with features good enough to make some of the others blush, but Style edges towards the luxurious. 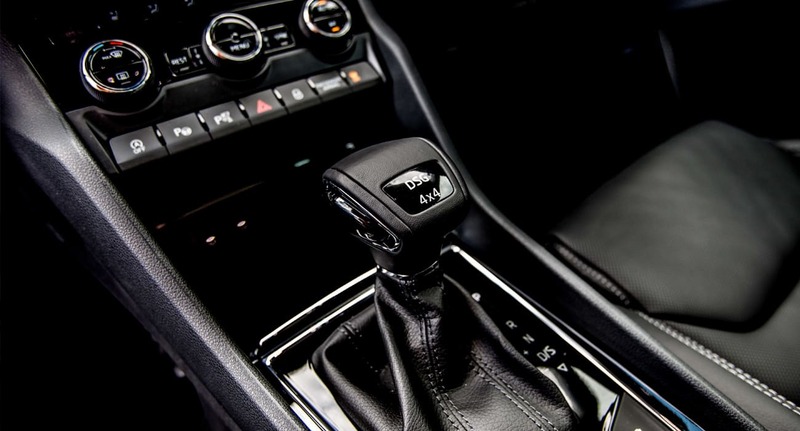 For example, depending on which variant you choose, the seats range from a fabric/leather combo to soft perforated leather and there are memory settings available for both you and your co-pilot (they can be heated AND ventilated too). It has a very adjustable 60/40 second row that can be moved forward or back, allowing additional legroom for the two seats at the rear. The seat manipulation makes room for the luggage space – heaps and heaps of it: from an ‘all seats up’ 270 litres (with extra underfloor storage) to a vast 2005 litres when they are all laid flat. There are also extra storage compartments dotted throughout the cabin, including phone stowage for the kids in the rear. When developing the Kodiaq, the Skoda tech team had evidently been plied with way too much coffee and subsequently ran amok. The 8’’ glass-fronted touch screen controls the Bolero infotainment, complete with Canton sound system and Columbus navigation. It also controls things like the LED ambient lighting and the digital voice enhancement that lets you talk through the speakers – making sure you’re heard all the way in the back row. The seven-seater SUV embraces vehicle connectivity, moving up the ladder from Mirrorlink/Carplay/Android Auto, to the new Smartlink and Smartlink+ (with their eyes focused on a true connected car in the future) and through a host of servers and electronic magic, the Kodiaq is beginning to have a far more meaningful relationship with you and your smartphone. It has a Trailer Assist option (think automated trailer parking) to go with its 2-tonne towing capacity (and a 50 millimetre retractable tow bar) as well as a rear brake function that minimises collision. It has an area view (360-degree camera) that can even look back at you, a pedestrian monitor (with emergency braking 5-30km/h) and a warning (30-65km/h) and this all leads into the SUV’s long list of safety aids (lane keep assist, blindspot alert, XDS+ torque vectoring, multi-collision brake…). Under the term ‘simply clever’, the Kodiaq has an array of family-friendly ‘helpers’ and answers to questions I didn’t even know I had. It has umbrellas stored within compartments in both front doors, plastic door edge protectors that automatically pop out and cover the door rims, an ice scraper by the fuel cap, the cup holder that grabs the bottle so you can open it one handed, a removable torch that magnetically attaches to the car body, the auto tailgate has ‘kick open’ functionality… I could go on and on. comes with a model-dependant choice of powertrains – a 1.4-litre TSI turbo petrol (110kW/250Nm), a 2l TSI turbo petrol (132kW/320Nm) or a 2l TDI turbo diesel (140kW/400Nm). 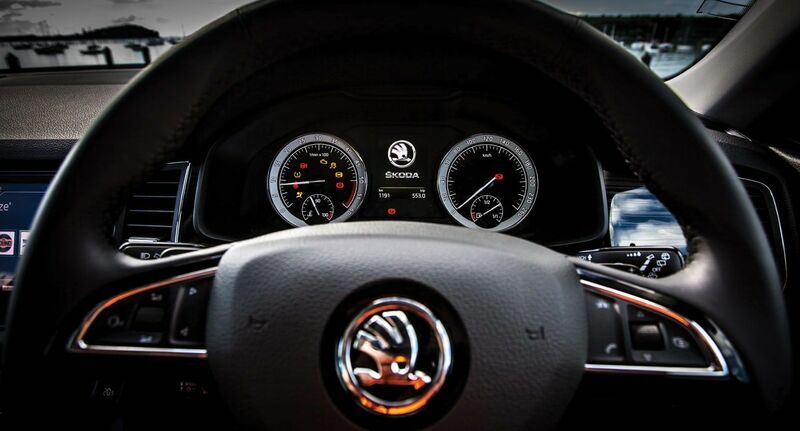 It has a six- or seven-speed DSG auto box and two- or four-wheel drive. With such a mind-boggling list of features bouncing around our heads, we welcomed the chance to get behind the wheel for the initial test drive – we opted for the ‘base model’ Ambition 1.4-litre/2WD first, with Castaways, at Waiuku, as our destination. The motorway part was effortless and gave us a chance to push buttons and familiarise ourselves with some of the aforementioned toys. In the absence of Sat Nav, connectivity to the phone and maps was simple and then clearly displayed on the touch screen. Even for a ‘base model’, the cabin felt refined with a great use of soft materials and wood-like paneling. Seats are comfortable and so was the ride. The road noise is low, which meant that the need for the digital voicing was – it sounds a little echo-y so I would probably only use with a full carload anyway. Heading off the highway gave us a chance to feel the lighter chassis work, cornering felt remarkably stable and the steering felt perfectly weighted… nice. After lunch, we picked the 2-litre diesel in Style. The engine is more torquey for sure, the chassis and ride comfort can be stiffened by changing driving modes and there are plenty more buttons to push, but the overall experience is as pleasing as with the Ambition – the choice will really come down to personal preference and more than likely use (such as towing). 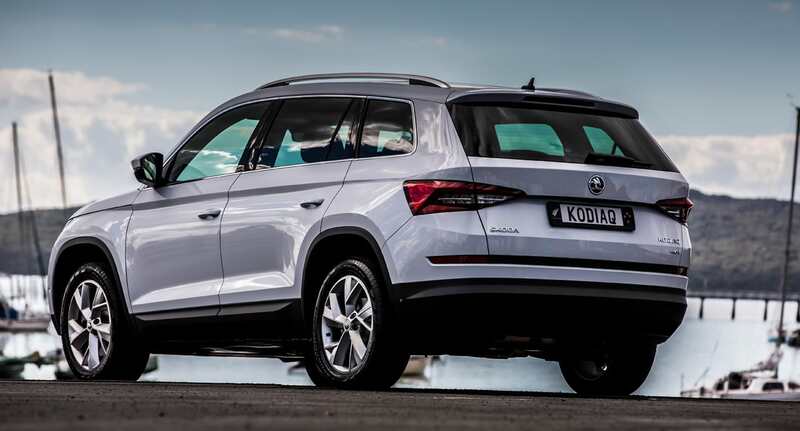 As it turns out, the Kodiaq is named after the Alaskan Kodiak bear, with the q being a tribute to the native Alutiiq people and language (the q indicating it is an animal name) but, hearing difficulties aside, I still think my version still has merit. Because, regardless of the true etymology, all the ‘signs’ are saying that the Skoda Kodiaq is a terrific family SUV.